Hana’s Ola Eleogram finished fourth in the finals of the Volcom Pipe Pro at Banzai Pipeline on Saturday. Photo by Bernie Baker. For the third consecutive year Hawaii’s John John Florence emerged grand champion of the Volcom Pipe Pro at Banzai Pipeline Saturday, eliminating Hana’s Olamana Eleogram, Chris Ward of San Clemente, Calif., and Australian Josh Kerr in the final. The 20-year-old produced another world-class performance at the famed Pipeline, which happens to be the backyard of Florence’s beachfront home on the north shore. Given the unpredictability of the ocean and competitive heats, Florence comfortably attacked the overhead conditions with epic barrels that earned him the $20,000 first-place check. Eleogram finished fourth and took home $5,500. The win gives Florence a huge boost going into the upcoming ASP World Championship Tour as he pursues the 2013 ASP World Title. The Volcom Pipe Pro is a 5-star rated ASP event, but does not count towards the world title rankings. With conditions favoring the rights at Backdoor on Saturday, Florence positioned himself perfectly for a pair of two great tube rides in the first three minutes of the 30-minute final, leaving his three opponents scrambling to keep pace. The early lead proved to be insurmountable as Florence slipped away from the pack, unnoticed, for his third scoring wave at Backdoor that would ultimately shut the door on the competition. Earlier in the day, Florence survived a super tight quarter final clash with three other surfers who have tasted victory at Pipeline: Jamie O’Brien, Reef McIntosh, and Bruce Irons. 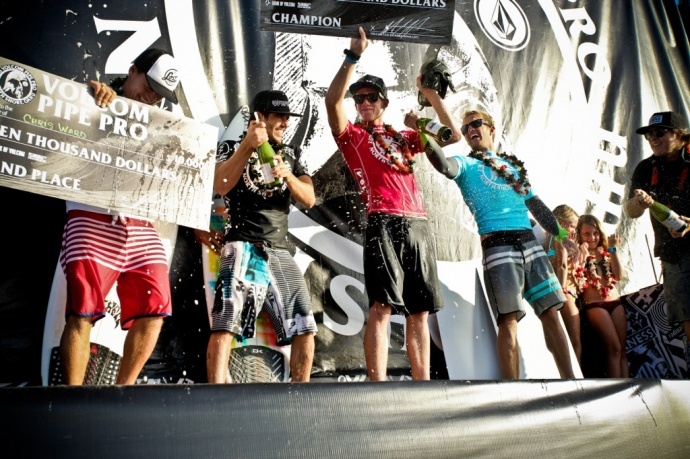 Hawaii’s John John Florence (red) celebrates winning his third consecutive Volcom Pipe Pro Saturday at Banzai Pipeline. Hana’s Ola Eleogram (black) prepares the champagne for Florence. 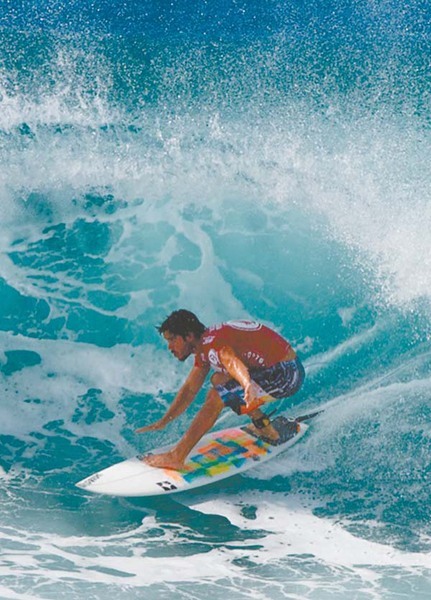 The Maui surfer finished fourth in the finals worth $5,500. Photo by Tom Carey / VolcomPipePro.com. There were moments of hope for Ward and Kerr, both of whom had been in brilliant form over the past two days of incredible surf. This was Ward’s second Volcom final in as many years. Prior to the final, Eleogram had been having the break-out performance of his life. But from the beach it was clear that Florence had tapped into a sixth sense in the final that can only come with a lifetime of watching and riding the most coveted surf spot on Earth. With that, he is sure to rule here for a very long time. Among the other winners Saturday, guaranteeing themselves a berth in the most prestigious professional surfing event on the planet: the year-ending Pipe Masters in December. The eight highest placed Hawaii surfers in this event, who are not already on the ASP World Championship Tour, win the wildcards: O’Brien, McIntosh, Irons, Eleogram, Kahea Hart, Kaimana Jaquias, Marcus Hickman, and Joel Centeio.